Following the death of the surviving spouse to second president of Zambia Frederick Chiluba, Regina, government through State House Principal Private Secretary Simon Miti has attempted to restore former First Lady Vera Chiluba as widow. 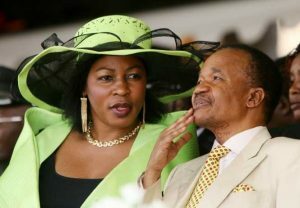 Chiluba divorced Vera Tembo Chiluba in 1999 following an allegation of adultery between Vera and car dealer, Archie Mctribouy. 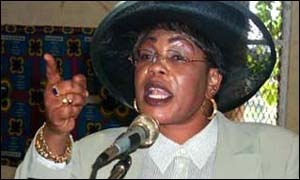 In 2002, Chiluba remarried and picked former MMD Chairperson Regina Chifunda Chiluba. Regina divorced her husband Edward Mwanza. Regina brought into marriage her children Bwalya, Malama and Mando. Chiluba had eight children with Vera Tembo that included Hellen, Miko, Hulda, Castro, Fred, Kaindu, Verocia, and Chongo. He also had Tito from his first marriage and another called one called Darlington from a woman from Kabwata. Chiluba was accorded State benefits as former head of state. Following his death, his wife Regina continued to get the benefits as a surviving spouse. To this effect title deeds to Chiluba’s retirement house under construction was issued to her. Following Regina’s death last year in 2017, government has made drastic decisions. Regina’s children that were leaving on Serval Road Kabulonga Chiluba’s home after leaving office have been evicted. Government through petitions made by Darlington Chiluba have stripped Regina of the retirement home. The titles will be issued to what government is calling “biological children”. They have also allowed Vera to be treated as widow or surviving spouse despite the fact that Chiluba had divorced her and remarried since 1999. Darlington has also led a failed court process to be given assets of Chiluba under Tedworth properties that were seized by the Taskforce on Corruption. Vera has turned Chiluba’s Home in Kabulonga as a church. Government has also grabbed the vehicles that were being used by Regina. Regina’s memorial was due in February and government refused to recognize or hold it on the understanding that Regina was not First Lady and was merely a spouse to a former president. I think this makes some sense, however but vera was divorced, but children remain Chilubas , I wonder what the late would say about his divorced wife since adultery was involved . I could imagine withe FTJ Vera doesnt exist any more since it was official divorce . I think what is left now is to ask his children weather they accept the verdict. it makes sense somehow though it can be debated, i feel the biological children first and then the other ones later…..because the ones Regina came with has there father its only that Regina had to go with them knowing where she was going but they have the father. its just a lesson and like what someone wrote that there was adultery involved. but step children can also get some shares too like it has been always.thats my opinion. The biological children and Regina also should benefit since she was legally married to Chiluba. If Regina’s children had considered Chiluba,s children and share everything their father left,l don’t think their would have going through the courts. The biological children should share every dime their father left. If Regina had her own separate things, then those are for her children. Its up to the biological children to share anything they want with Regina’s children.that’s why when you marry someone with children, always have your own separate belongs for you and your children to avoid what is going on now. She was busy divorcing her first husband, forgetting to secure her children’s wealth for the future.l hope women will learn a lesson from this.